A team of kids, a spooky mansion, mystical worlds and magic powers. If that doesn’t sound like a recipe for good TV, then what does? Just as talks about a Sandman TV show are heating up, another fantasy-sprinkled comic book is on the way to the small screen, and this one’s got some big guns behind it. Joe Hill’s Locke & Key is getting closer to being made into a TV series, according to Vulture. DreamWorks TV (read: Steven Spielberg) reportedly is teaming up with Alex Kurtzman and Roberto Orci (Fringe, Star Trek, Transformers) and producer Josh Friedman (Terminator: The Sarah Connor Chronicles) on the project. Locke & Key began publication with IDW in 2008, telling the stories of three kids who keep watch over a New England mansion filled with doors that transport them to different worlds and give them special powers. Dimension purchased TV and film rights back then. There had been rumors of a movie adaptation, but now TV appears to be the direction. Fox is in contact about picking up the series, which could join sci-fi time-travel yarn Terra Nova into the Spielberg-Kurtzman-Orci fold. READ THIS! 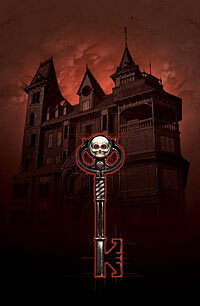 Locke & Key: Keys to the Kingdom #1!